It must seem to he reader of this site that the only we get in North London relates to Victorian and Edwardian tiled floors. 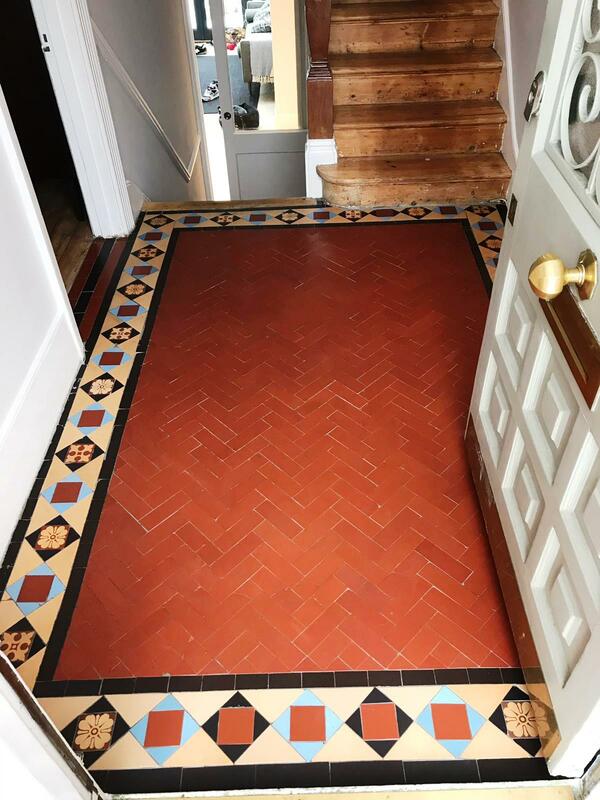 They are certainly popular, and we do get our fair share, but I can assure we also work on all types of tile, stone and grout however at the moment there appears to be a huge demand for our services in restoring Victorian and Edwardian tiled floors. This post which comes from a property in the London suburb of Muswell Hill which is well known for Victorian and Edwardian houses. 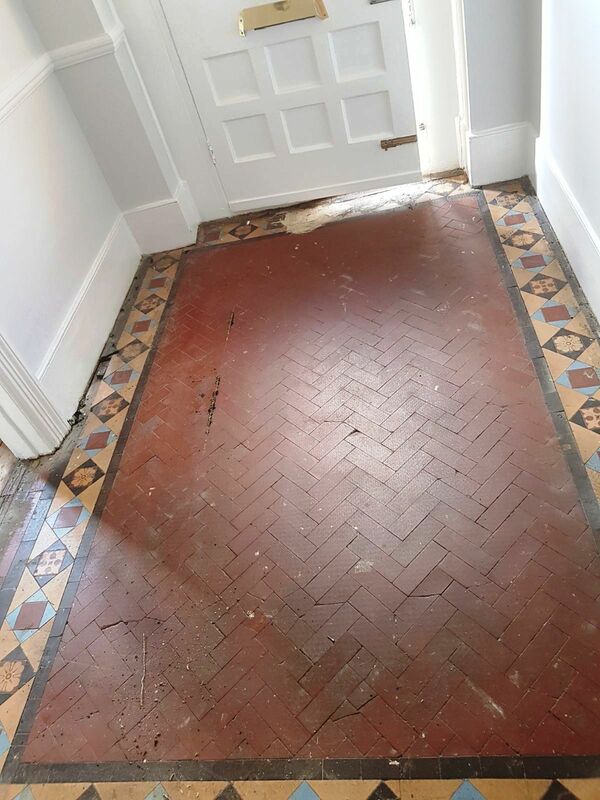 The owners had decided to improve the look of their hallway and uncovered an original Edwardian tiled floor after pulling up the carpet. Realising it was an original feature of their period property they decided to get it cleaned, repaired and restored back to its rightful splendour. 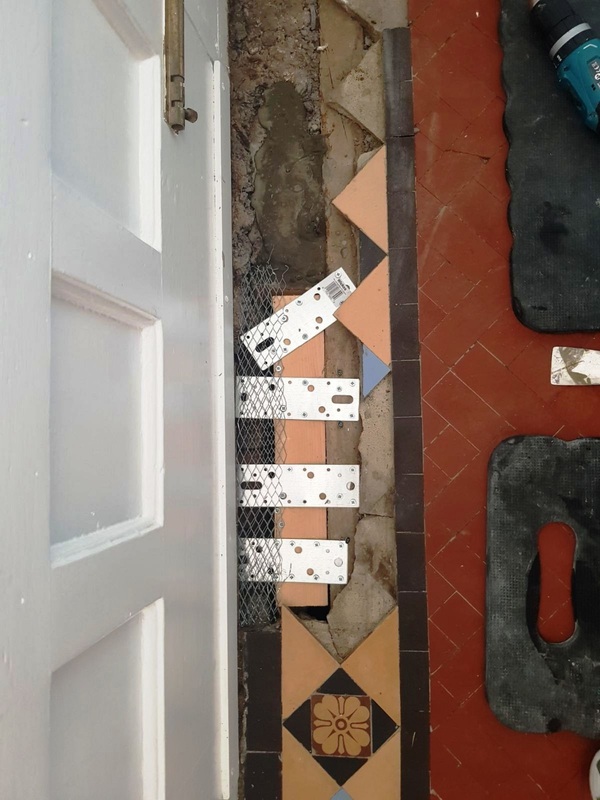 Our first task was to protect the area surrounding the tiles from splashing by applying a protective polythene tape to the thresholds and door fronts etc. We then started preparing the floor for cleaning by removing the glue that was used to hold the carpet gripper to the tiles. A sharp blade was used to carefully scrape the adhesive off the tile and then the area was spot treated using a strong dilution of Tile Doctor Remove & Go which was left to soak into the tile for ten minutes before being scrubbed by hand. With the adhesive removed the whole floor was given a thorough clean using a strong dilution of Tile Doctor Pro Clean. The cleaning solution was left to soak in for ten minutes and then they were scrubbed with floor pads fitted to a rotary buffer machine and then by hand with stiff brushes. The floor was then rinsed, and steam cleaned with the soiled extracted off the floor using a wet vacuum. We managed to take a photo as seen below showing the floor half way through the cleaning stages. 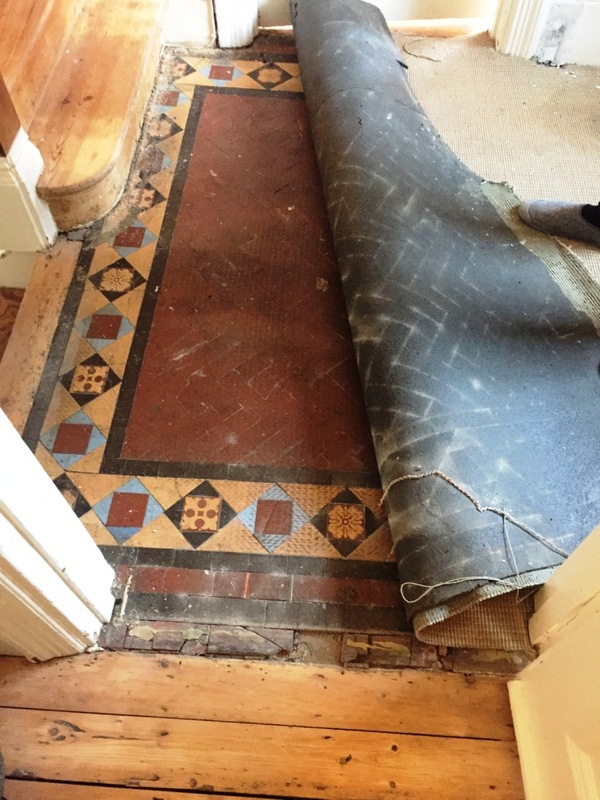 Whist carrying out the repairs to inside the front door we uncovered a distressed surface underneath the tiles, probably from all the foot traffic walking over it for so many years which required some much-needed attention. After carefully taking out the required number of tiles and setting those aside we had to lay a new covering of cement and insert stainless steel mesh plates to level the floor. 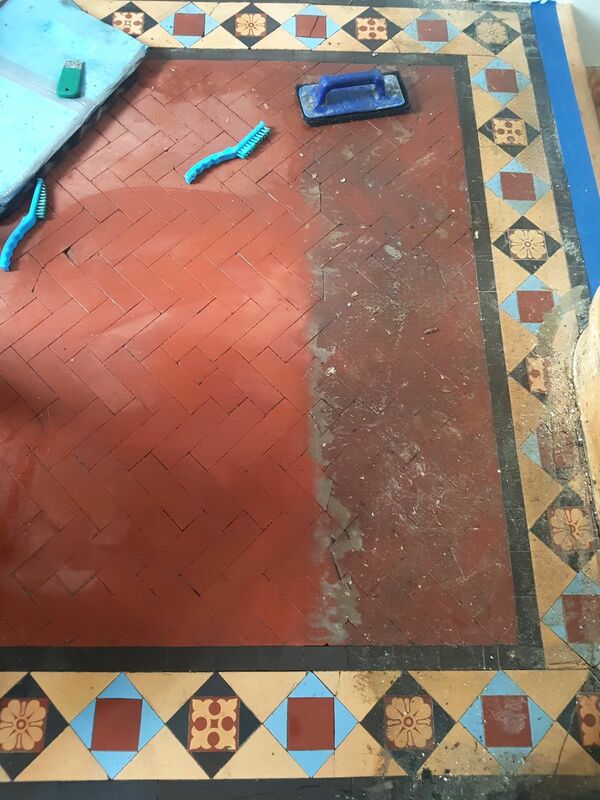 After the installation of the tiles, the floor was re grouted and thoroughly cleaned and left to dry off overnight. We returned the next day to seal the floor, first checking to ensure the tiles had dried out overnight. To start the sealing, we applied a single coat of Tile Doctor Colour Grow with leaves a matt finish and left it to dry. Colour Grow is an impregnating sealer that provides stain protection whilst enriching the colour of the tiles in the process. 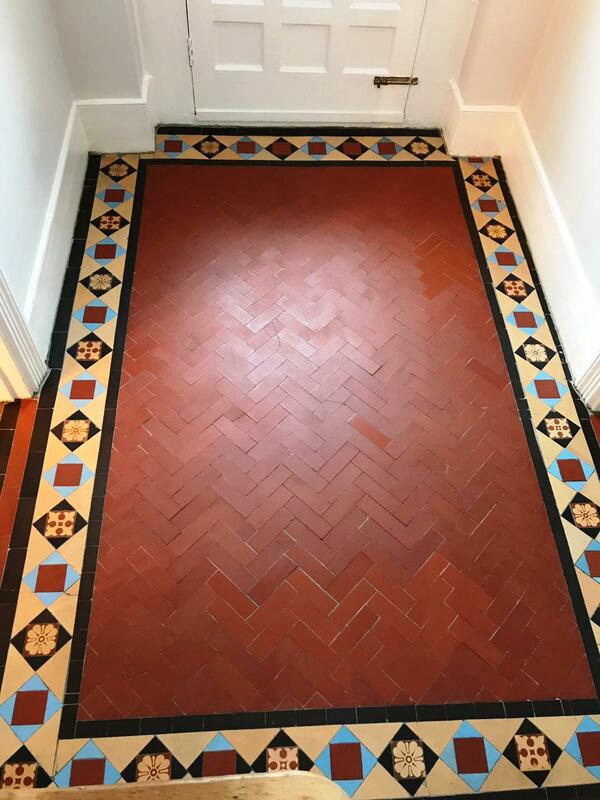 Once the first coat was dry it was followed by the application of six coats of Tile Doctor Seal & Go which adds further layers of protection but leaves a satin finish that gives a rich, natural appearance and works really well on Victorian and Edwardian tiles. 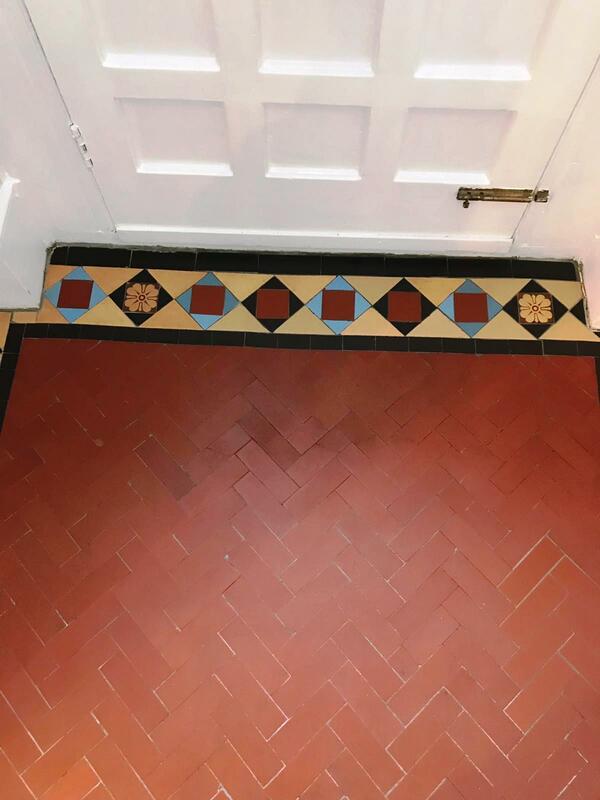 This entry was posted in Victorian Posts and tagged Carpet Glue Removal, Edwardian Style, Edwardian Tile Cleaning, Edwardian tiles, hallway floor, Hallway Tiles, london, Muswell Hill, restoration, steel mesh plates, Tile Repairs, tile sealing by AbzDominise. Bookmark the permalink.